Similar to the review on "Buttons.bas" PopUp.Bas is another demo program. 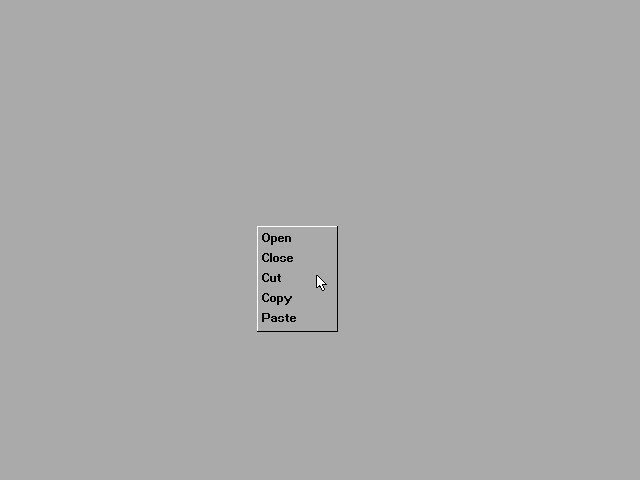 This one features a popup menu when you click the right button on your mouse. The implementation is simple and does not feature a lot of UI designs or enhancements. If a programmer used this, there's an "actions" portion of a subroutine which allows for certain tasks to be done when a menu item is clicked. There was some trouble getting the fonts to work so you'll need to look up the "fopen" statement inside the source code to check that the correct path is specified for the "SmallSys.qbf" font file. There were also two syntax errors: A for loop missing a "NEXT" which I inserted on the second line after it, and a "LOOP" missing for a DO-LOOP which I inserted after the "END SELECT". This seemed to do the trick. Other than that this is just a test program - nothing fancy.